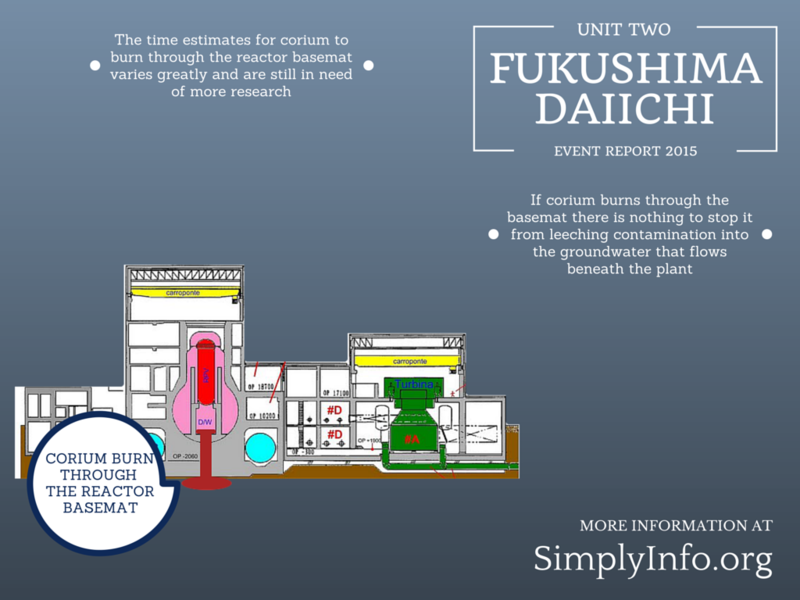 During the early events of the Fukushima Daiichi disaster unit 2 was given little attention in public facing information. It also appears that many of the outcomes from unit 2 may have been credited as being caused by other units a the plant or considered of unknown origin. Unit 2 may have been much worse in actuality than the public was being told and a larger contributor to the crisis. 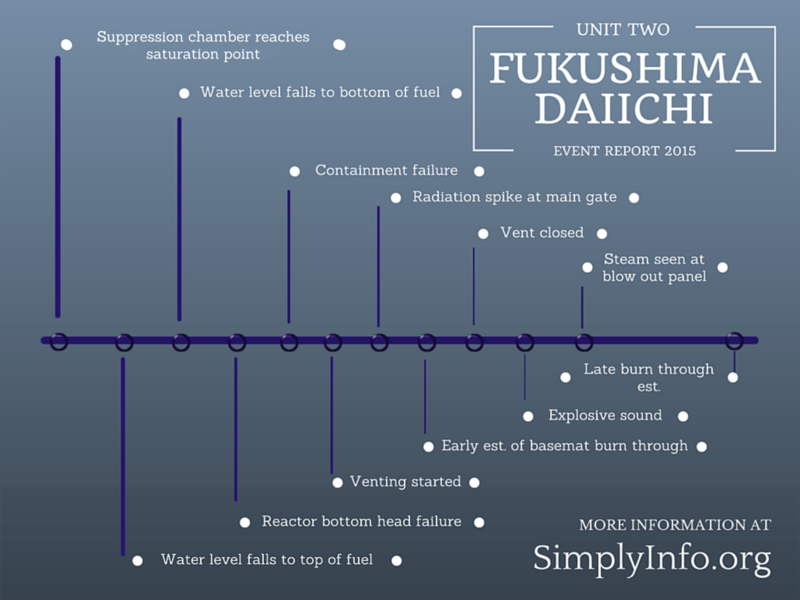 We reviewed multiple timelines and documentation sources of the events at Fukushima Daiichi and those specific to unit 2. This provided a clearer picture of what larger events may have been associated with unit 2’s event and the magnitude of the events inside unit 2. These events compared to the existing research into reactor failure modes and meltdown behaviors found that the events closely matched the expected outcomes. We began to revisit the events at unit 2 after TEPCO made more admissions on the difficulty to seal and clear the unit 2 trench of contaminated water. The original reason TEPCO had given was that the trench was being fed by water from the turbine building through the interface between the two. After concreting this section only to discover highly contaminated water continued to refill the trench as they pumped it out was yet another issue that made TEPCO’s explanations illogical. In more recent news Japan’s regulator, the NRA, stated that they think Fukushima Daiichi continues to leak contaminated water out to sea despite measures to block water flow. They assume that water is leaking down below these installed measures then finding a way to flow out to sea. 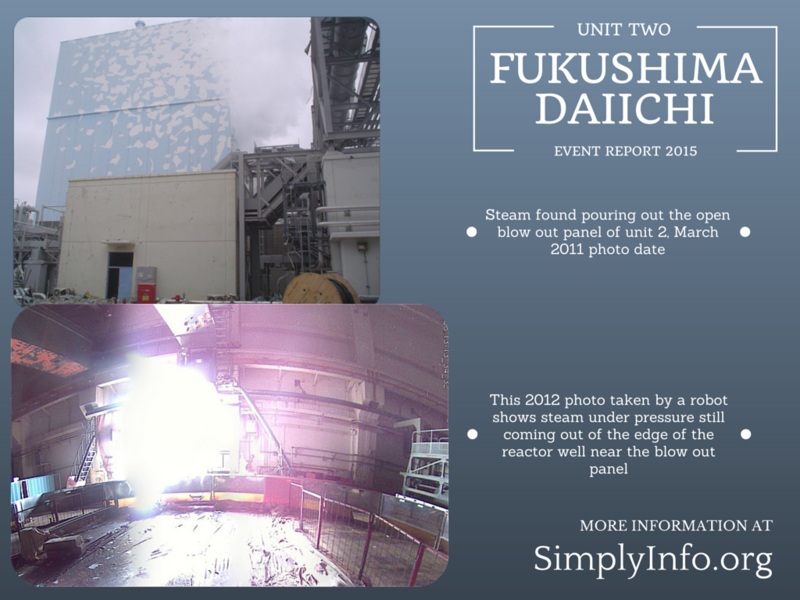 In this report we will explain the events at unit 2 along with the findings over time that help refine the understanding of unit 2 in order to have an improved and more realistic picture of what has happened. Click on images in the report to open a larger version. When the earthquake hit, unit 2 scrammed (shut down) properly and the emergency diesel generator started after offsite AC power was lost. Workers manually started the Reactor Core Isolation Cooling (RCIC). The Main Steam Relief Valve (SRV) system was running on automatic functionality to depressurize the RPV (reactor pressure vessel) as needed. The Residual Heat Removal (RHR) system, which provides cooling for the suppression chamber, also began to function. The RCIC system repeatedly shut down, workers were able to manually restart it as needed at this point. The RHR system also stopped running, workers took interventions such as starting the Suppression Chamber (SC) cooling spray system at this point. Before the tsunami hit the plant these basic response systems were operating. After the tsunami hit unit 2 lost all offsite AC power, diesel generators and portions of the power distribution system for the reactor building. Without DC power available the High Pressure Coolant Injection (HPCI) system was unavailable. This also took out the functionality of the RHR system. The RHR system needs both a power source and a cooling loop that starts with a sea front pump now wiped out by the tsunami. Also lost was any emergency lighting in the reactor building and control room along with the ability to monitor the HPCI or the RCIC. They were able to restart the RCIC manually but had no way to tell if it was operating properly, all instrumentation was down. This meant they could no longer read gauges and monitoring equipment to tell what was going on in the reactor or related systems from the control room. By late in the evening on the 11th of March they were able to obtain some limited emergency lighting and at 21:02 discovered that the water level in the RPV was at the top of the fuel. As soon as the fuel is no longer covered with water a meltdown begins. At 21:50 they were able to read a water level gauge and found water to be 3400 mm above the top of the fuel. At the same time they were not able to confirm that the RCIC system was actually running. Workers were sent into the reactor building basement to see if the RCIC was actually operating. Around 2:55am March 12 workers were able to get to the room where the RCIC is housed but water was deep enough it would top their rubber boots. They could hear a faint metallic sound they assumed to be the RCIC running. A second attempt to reach the RCIC room found water levels in the room had increased. Workers were able to find an instrument rack in the building and checked the RCIC exit pressure to confirm it was operating. At 4:20am March 12, workers had to switch the RCIC system from drawing water off the Condensate Storage Tank (CST) to the SC (suppression chamber), mostly likely due to the tank running out of water. This is a critical change in the process. The water inside the SC is needed to cool steam releases from the RPV. Without sufficient cooling water in the SC they would lose the ability to relieve RPV pressure. The suppression chamber can quickly reach a saturation point where the internal temperature and pressure can no longer cool incoming steam from the RPV via the SRVs and the hot steam discharge from the RCIC turbine. Without the RHR system to cool the water in the suppression chamber heat can build up quite fast. This over heating of the water in the suppression chamber can also create a situation where the water once released from the contained space turns to steam. In a situation such as a suppression chamber routed emergency venting of the reactor to the environment, the over heated water would escape as steam vapor along with the radioactive gasses and fission products out the vent stack. The suppression chamber reaching this saturation point means that it can no longer provide filtration for the vent releases. A BWR mark 1 reactor, like units 1-5 at Fukushima Daiichi has the potential to scrub 80% of the non gas isotopes out of venting releases in an optimal situation where the suppression chamber has water inventory and is cool enough. Water levels in the RPV remained above the fuel but RPV and containment (drywell) pressure were beginning to climb. At 17:30 on March 12 plant managers ordered the containment venting of unit 2 to relieve the increasing pressure. Two vent valves were opened (MO-271 and AO-205) and a venting was commenced at 11:20 am on March 13. This venting may not have actually worked as the reactor containment pressure continued to climb. By 0:05am on March 14th, plant managers ordered the injection of sea water to attempt to cool the reactor. Actually accomplishing the sea water injection would be much more complicated. Pumping fire trucks were needed to try to bring water up from the sea front with enough capacity to move water up the rising elevation. Also this same morning pressure and radiation levels in the SC began to rise. When unit 3 exploded it damaged both the fire engine water injection line and the AO-205 SC vent valve. The RPV water level had now dropped to 2950 mm above the top of the fuel. By middle of the day on the 14th plant manager Yoshida had contacted the TEPCO home office asking for ideas how to relieve hydrogen from unit 2 fearing it would explode as units 1 and 3 had. What they were unaware of at the time was that the unit 1 explosion seemed to have removed the blow out panel of unit 2. Satellite photos showed it was ejected before unit 3 had exploded. This may have created a safe route for hydrogen to escape the building, preventing an explosion of the building. Workers were still trying to establish a fire line to inject sea water into the reactor. Reports warned that the RCIC system would soon run out of available water, leaving the workers with no available way to inject water. At 13:25 on March 14th the RCIC system finally failed. Reactor water level was 2400 mm above the top of the fuel and drywell pressure continued to rise. By 14:00 it was reported that the SC had reached the saturation point. It could no longer provide water for the RCIC cooling system and could no longer provide steam relief to the SRV system from the reactor. 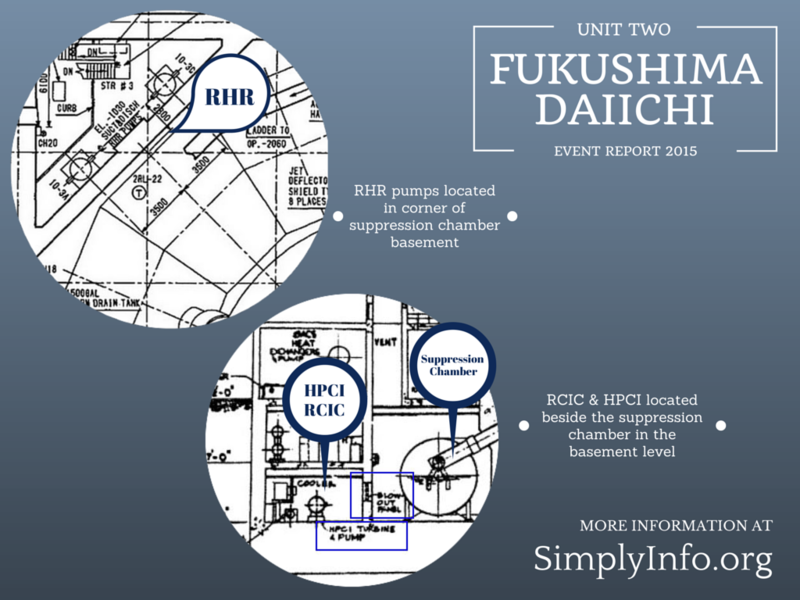 TEPCO reported the RCIC system as going out around this time but did not specifically tie it to the heat up of the suppression chamber as they used other means to determine the RCIC had stopped. At 16:34 an SRV was opened to relieve pressure in the RPV and seawater injection was started. The problem now was that the fire line system used to inject water lacked back flow limiter valves. This meant that all or much of the water being desperately injected through the fire line may not have made it to the RPV but instead flowed backwards into the condenser in the turbine building. At this time the office at Daiichi informed the disaster office at TEPCO’s HQ in Tokyo that they need to vent the reactor containment and not doing so could cause them to be unable to inject water. Since the ability to effectively suppress steam pressure was now lost with the saturation of the SC, venting became more crucial. At 17:17 on March 14th, water in the RPV fell to the top of the fuel. This is the critical point where fuel failure and a meltdown might begin. At 18:02 and 18:06 two SRV valves are opened using scavenged car batteries. The SRV valves needed to release RPV pressure no longer had power or available air pressure to operate the valves. With the batteries workers were able to operate these two valves to relieve pressure but with the SC no longer having sufficient cooling ability these releases had limited over all effectiveness. At 18:22 on March 14th RPV water level drops to the bottom of the fuel assemblies. 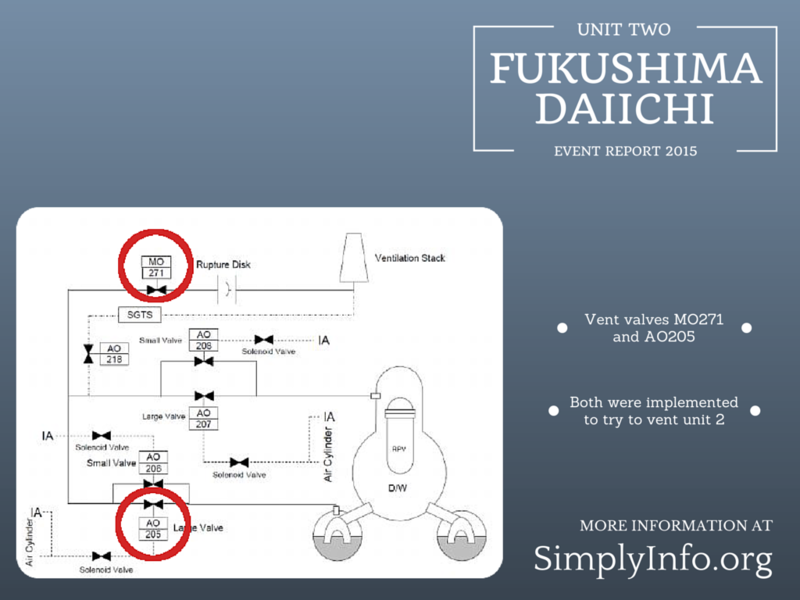 With increasing reactor pressure, limited ability to relieve that pressure and water injection having apparently no ability to refill the RPV, TEPCO HQ began discussing evacuating the workers from the plant. At this point there were not any other events at the plant that coincided with this new concern to evacuate workers. At 20:31 March 14th, radiation levels at the main gate reached 8217 uSv/h. With the meltdown well under way and no quenching ability in the SC, workers prepared to vent the reactor via the SC. Water in the SC is assumed to be in place and cool enough to act as a sort of filtration during a venting operation. Cool water would provide some “scrubbing” of radioactive contamination during a reactor venting in an emergency. With unit 2’s SC water past the saturation point there was no longer any “filter” in place. The remaining highly heated water in the suppression chamber likely escaped as steam. Anything released through these vents would be a direct venting of the containment system and with SRV opening, a direct vent from the RPV itself. 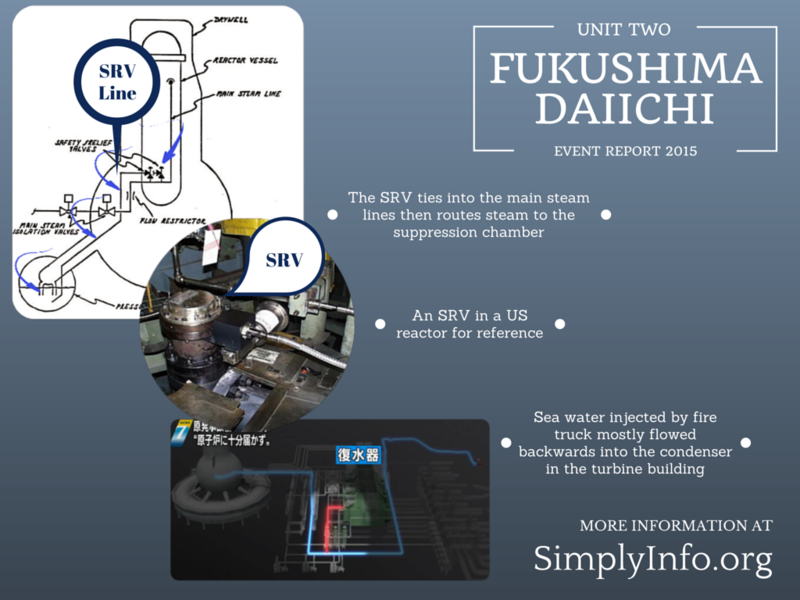 At 21:00 March 14th, workers vented the reactor via the SC using an available working valve. This now creates a direct path for radioactivity from the containment structure to the environment. At the same time radiation at the front gate jumped to 11930 uSv/h and neutrons were detected at the main gate. With containment pressure again at dangerous levels workers released steam from the RPV via the SRV to the SC that now has a direct open path out of the reactor to the environment. They left this SRV open for about 1 hour and 45 minutes in this state. At 21:20 they were able to see some recovery in the water level inside the RPV but it was still below the top of the fuel. By 21:55 radiation levels in the containment and SC had begun to rise. At the same time the containment structure had exceeded its design pressure limit. At 22:22 is the earliest concrete basemat burn through estimate. This is based on the WASH-1400 report estimates for potential burn through rate of corium upon a concrete basemat, leading to release of the melted fuel to the ground below. This number is highly speculative and even now the state of corium concrete reaction burn through rates are not well understood. Hard exact numbers do not currently exist for this phenomenon with experiments, modeling and estimates ranging from rates that would show as little as 3 hours up to 2.7 days for unit 2’s corium to potentially burn through the basemat. At 23:35 the SC venting valve was finally closed. For about 2.5 hours there was an open line between the reactor containment and the environment with no filtration. At the same time that the SC vent valve was closed it was noted that containment pressure continued to rise and exceed design pressure. The containment pressure in the drywell was considerably higher than the SC. One possible explanation is that the downcomer pipes were not allowing pressure to equalize between the drywell and SC or something was generating considerable pressure ongoing in the drywell. One potential cause of pressure generation in the drywell is a molten corium concrete reaction where the melted fuel is burning into the concrete floor of the drywell. This reaction creates a considerable amount of gasses and radioactivity that can be released to the environment. At 0:02 on March 15th there was a failed attempt to vent the drywell directly. The valve attempted failed to stay open. Radiation inside the reactor containment and the SC continued to be high. At 2:47am the evacuation manual document for the plant was modified. Drywell pressure and radiation readings for the drywell and SC remained high. At 6:00 am March 15 an underground explosive sound was heard at the plant. One of the higher ups at the plant described the sound as a “doon doon” type sound. The same worker in a later interview made the assumption that this was “china syndrome” happening. INPO reports that there was no seismic signature at the time of the explosion. This would indicate it was not an explosion similar to the other large building explosions at the plant. TEPCO initially assumed that the suppression chamber torus tube had failed and was the source of the sound. Later investigations found no damage to the torus tube or indications of any sort of explosion in the suppression chamber room. INPO reports that the sudden loss of pressure in the suppression chamber may have been an instrument failure. Radiation levels at the main gate began to rise at the same time as the explosion event. At 8:25 am workers discovered large amounts of white smoke leaving the unit 2 blow out panel on the refueling floor. This could have been going on for longer, this point was the first sighting of the problem. Workers were limited to the time and locations they could be outside and were seriously limited in ability to see at night without any functional lighting systems at the plant. By 10:15 radiation levels had reached 8837 uSv/h then gradually dropped over the remaining morning. At 14:00 workers manually opened SRV2 to lower the pressure in the RPV. At 15:25 it was discovered that the containment drywell pressure was higher than the SC pressure. This could indicate that the SRV valve was failed and releasing steam into the containment structure rather than into the suppression chamber. It could also be an indication of events going on in the drywell that were generating more ongoing pressure than what was in the reactor vessel. At 19:50 there was an attempt to inject sea water with boron to try to cool the reactor and suppress criticality. The injection was done via the fire line to the RPV core spray ring. It was later admitted by TEPCO that these water injection attempts via the fire line may have all or in part backflowed into the turbine building condenser due to the lack of backflow limiters. A more recent admission via an NHK investigative report showed that only 1 ton per hour of this injected water made it into any of the reactors out of a rate of 30 tons per hour that was pumped. 1 ton per hour converts to about 4.4 gallons per minute, roughly the contents of a 5 gallon bucket sold at most home improvement stores. Most of this water backflowed into the condenser in the turbine building. NHK’s report included an experiment that showed these small amounts of water reaching the reactor may have actually made things worse. The water created steam off of the hot melted fuel and zirconium cladding, creating a highly radioactive water vapor that was leaking out of the reactors. At 21:30 radiation at the main gate had fallen to 282.6 uSv/h but jumped back up to 6960 uSv/h by 23:10. By 23:30 it had reached 8080 uSv/h. Radiation levels at the main gate remained elevated until 4 am March 16th when they began to drop. At 6:55 am a significant radiation jump happened again in the drywell with a reading of Drywell 9.72E+01 (97.2 Sv/hr). Drywell radiation readings would stay at this elevated state throughout the remainder of the day. At 10:20 March 16th radiation at the main gate had again begun to rise and was at 2399 uSv/h. By 12:30 main gate levels were back up to 10850 uSv/h. 1:22 am on March 17th is the estimated basemat burn through point using the WECHSL computer model estimates for a BWR reactor. The WECHSL code estimates 2.5 to 2.7 days from the start of concrete ablation until the corium mass would burn through the entire basemat of concrete. At 10:50 on March 17th main gate radiation levels had fallen earlier in the day but now began to rise again with a reading of 3742 uSv/h. Drywell radiation levels remained elevated through the day with readings in the 8 to 7 range. On March 18th at 2:35 am white smoke was cited as coming out of unit 2’s blow out panel. It was not clear if this problem had subsided and reappeared or if it was just again confirmed to be happening. Over the next 3 days radiation levels in the drywell gradually reduced from 7’s to 6’s. On March 21 smoke was again cited as being seen out the unit 2 blow out panel. On March 26th, 1 sievert/hour radioactive water was discovered in the unit 2 turbine building basement. Later the same day some power was restored to the turbine building and control room for unit 2. 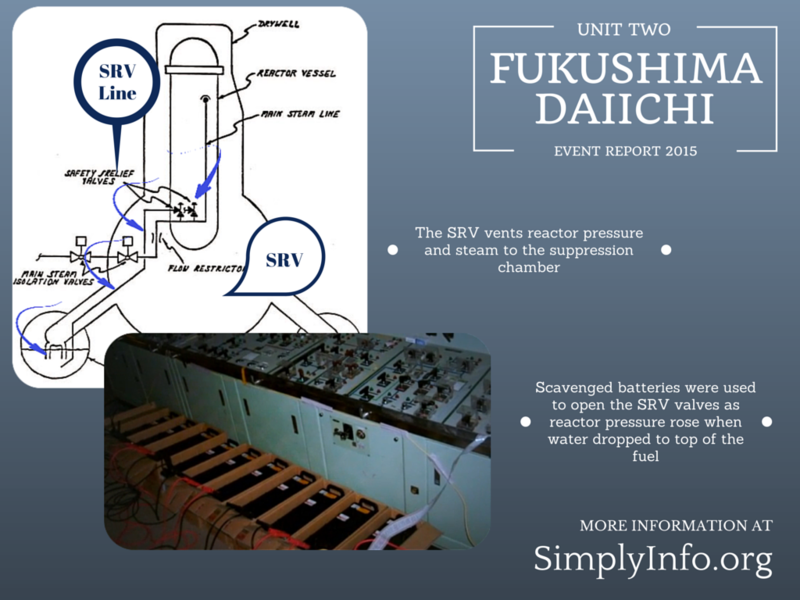 On March 27th 1 sievert/hour radioactive water was found in the unit 2 cable trench. Water was leaking in through a crack in the concrete wall of the trench. The timeline of events shows how various events at the plant coincide with the meltdown progression at unit 2. Many of these incidents at the plant did not have clear causes tying them to events at other reactors. By inserting them into the timeline of events at unit 2, many of these events begin to become clear that they may have been influenced by unit 2. The timing of major events that are either known or reasonably estimated by other means show a somewhat clear pattern of events with windows where certain phases of the meltdown were likely to happen. Early events such as the saturation point of water in the suppression chamber and the eventual failure of the RCIC cooling system precipitated the meltdown of the reactor core. Without any means of cooling, the meltdown was inevitable. At 17:17 on March 14th water levels dropped to the top of the fuel assemblies. Without a way to recover the water level this began the chain of events that became the meltdown of unit 2. By 18:22 water levels had dropped to the bottom of the fuel assemblies, assuring a meltdown as no successful water injection was available. Also critical at this point is that the suppression chamber no longer functioned. This meant that venting of steam out of the RPV via the SRVs had limited effect and any venting of pressure to the environment would be unfiltered. TEPCO was clearly alarmed by the events in reactor 2 at this point. They began discussing evacuating the plant at this point. At 19:22 on March 14th the estimated time of RPV bottom head failure was reached. At this point melted fuel would begin falling into the pedestal region of the containment structure. In another ten minutes the melted fuel would begin to burn through the concrete floor of the containment structure. 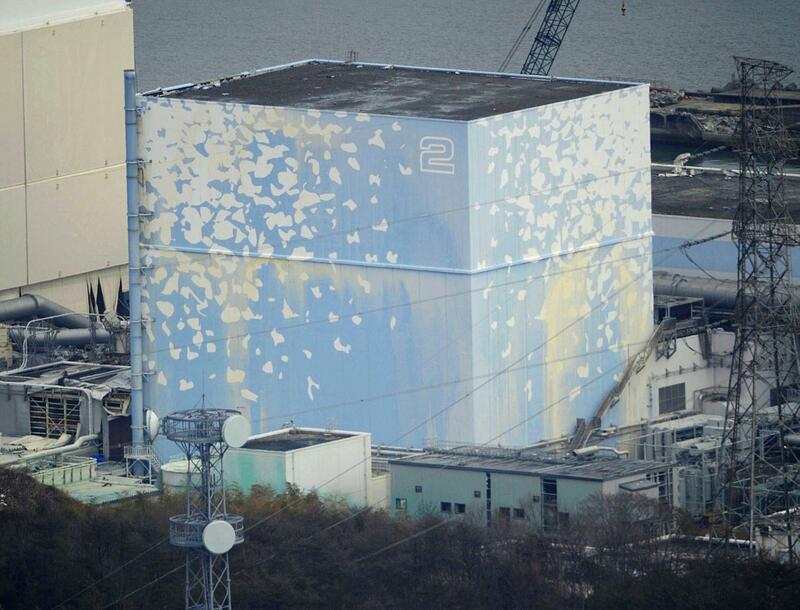 Our estimate of containment failure is at 19:55, TEPCO’s is at 20:22. This could be a failure of the top head gasket of containment, failure of multiple penetration seals or failure of the containment structure itself. At 20:31 radiation began to rise at the main gate. At 21:00 the RPV was vented through the now saturated suppression chamber, this vent line to the environment was left open for 2.5 hours during the height of the meltdown and with melted fuel likely relocated to the drywell. At the same time the reactor was vented, neutrons were detected at the main gate and radiation levels jumped to 11930.0 μSv/h. Twenty minutes later workers opened SRV2 to vent steam out of the RPV into the saturated suppression chamber with the vent to the environment still open. Drywell and suppression chamber radiation levels had begun to rise and at 22:22 the point of potential burn through of the basemat based on WASH-1400 is reached. At 23:35 pressure in the drywell is higher than in the suppression chamber, indicating something significant is going on. The corium concrete reaction, the SRV valves failing into the drywell or a combination may be adding to the excessive pressure in the drywell. With both the drywell and RPV pressure high, workers tried to vent the reactor directly from the drywell but this effort failed when the needed valves would not open. The vent attempt was at 0:02 on March 14th. At 2:47 am the evacuation manual for the plant was updated, indicating they still considered a serious risk to safety at the plant. At around 6:10 am on March 15th multiple workers reported hearing an explosive sound underground at unit 2. 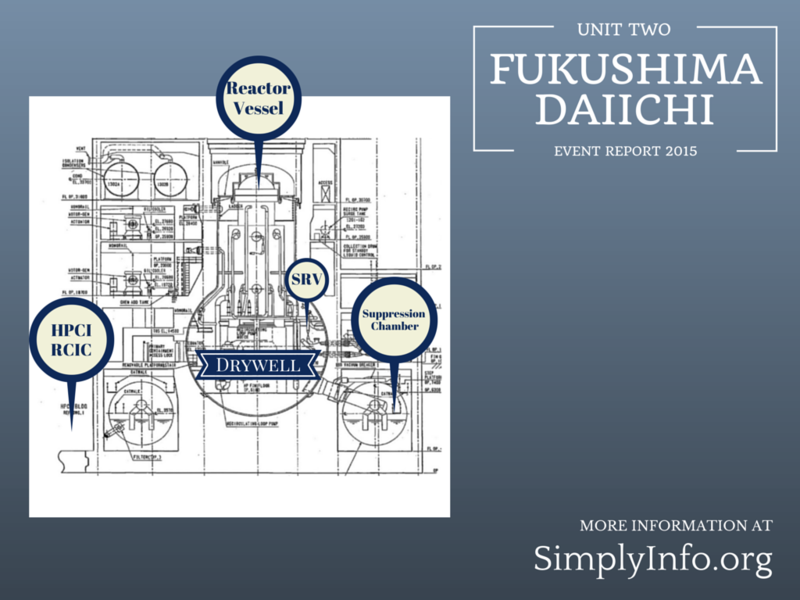 Yoshida considered the issue of having the drywell pressure higher than the suppression chamber and the underground explosion sounds as grounds to declare an emergency at the plant. He assumed this was a sign of containment failure. Between 6:21 and 6:27 am emergency measures such as evacuating to the bunker building and wearing charcoal masks was ordered. It was after this point in the early morning that some of the staff evacuated to Fukushima Daini. 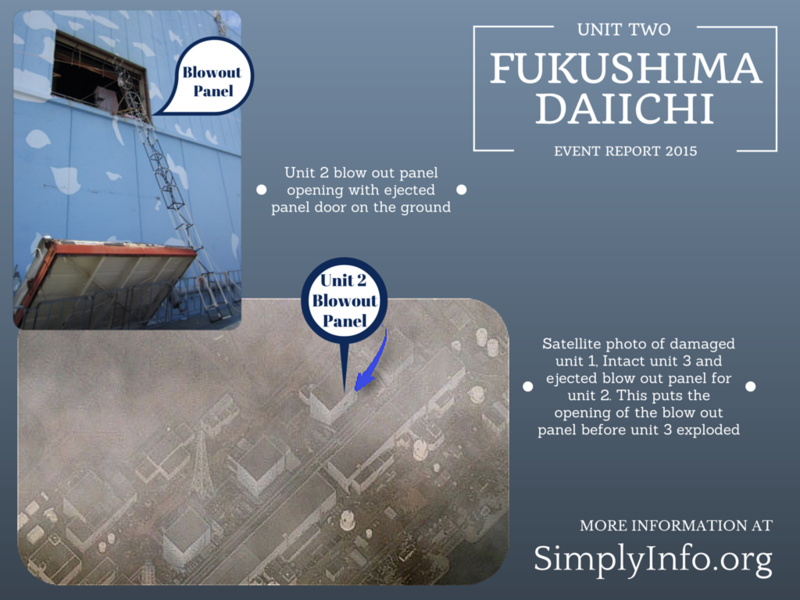 By 8:25 heavy white smoke was seen leaving the unit 2 blow out panel and radiation levels began to rise. The heavy white smoke or steam was recorded multiple times over the morning. High levels of radiation were also found in the reactor building at this time. These critical events show that once cooling was lost, the meltdown happened rapidly. Best estimates of the events following the core melt align with other known problematic events at the plant. As we compared events and data in a unified timeline we found some reasonable assurance that certain events were connected. The unfiltered venting of unit 2 through the suppression chamber matched to the exact time of the major radiation spike at the front gate and discovery of neutrons also at the front gate. The unequal reactor pressures and explosion sound fit within the fairly broad range of existing estimates for corium burn through of the basemat and are well after all expectations of RPV bottom head failure. By looking closer at the events of unit 2 it caused some reconsideration of the contamination of the unit 1-2 vent stack. 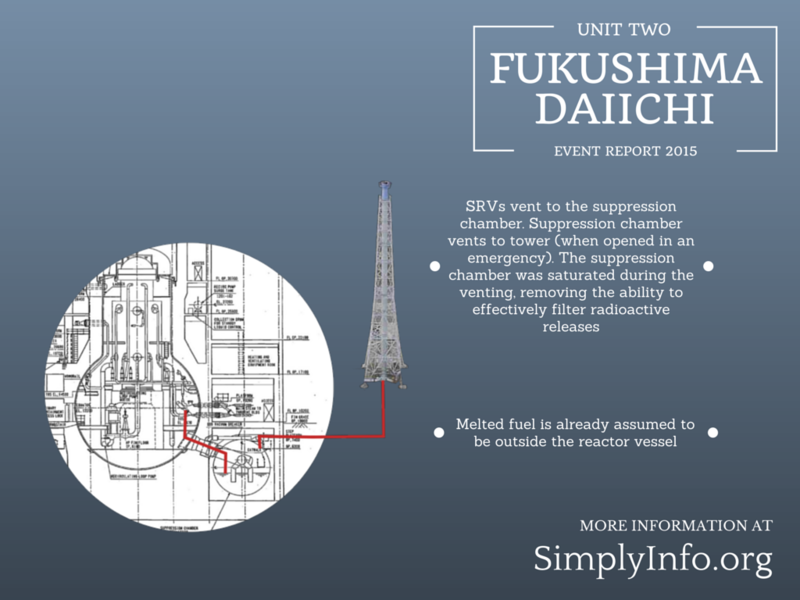 It has been assumed that unit 1 was the likely cause since unit 1 had sections of the vent pipe inside the building with high levels of residual radiation. Similar scans inside unit 2 have not been made public. 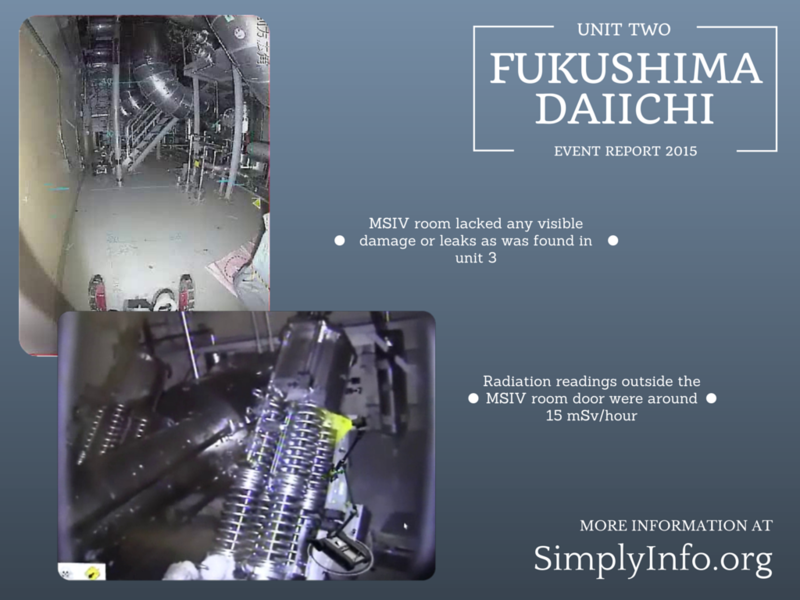 With the situation during the 2.5 hour venting of unit 2 it is certainly possible that unit 2 contributed a significant amount of the residual high contamination levels found now in the unit 1-2 stack. This would also mean that some of the early assumptions about releases from the reactors and timing of releases blown in plumes out of the plant might need reconsideration. The potential behavior of the melted fuel mass after leaving the RPV is critical to assumptions on the later events in unit 2. 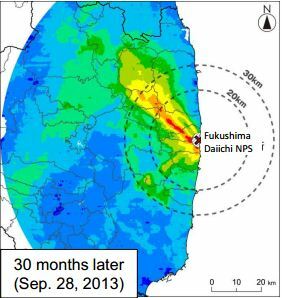 Sandia National Lab’s modeling of the Fukushima meltdowns assumes unit 2’s corium did not leave the pedestal in any significant amount. The existing research on the rates that a corium mass could burn through the reactor concrete basemat varied greatly. Most research did not conclude directly applicable burn rates for specific reactors or meltdown scenarios. The very few that did varied widely with one as short as 2.5 hours and another at 2.5 days. This gives at least a broad window where an assumption of a total melt through could be placed. 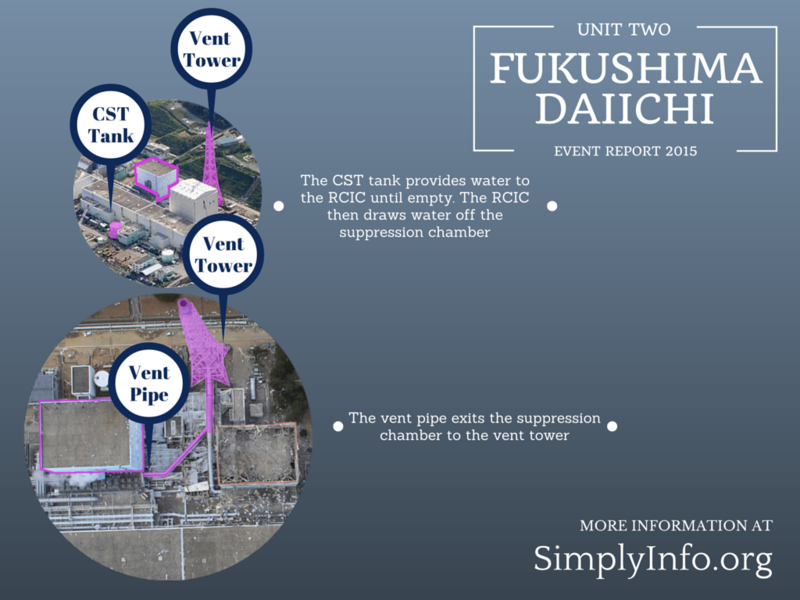 The RCIC system was the only functioning reactor cooling system after the tsunami hit. This system is limited by the volume of water available in the condensate storage tank and then the suppression chamber. The suppression chamber at the same time is trying to deal with the quenching of steam from the reactor and output steam from the RCIC drive turbine. Workers also struggled to confirm if the RCIC was working after they lost all power. This required workers to enter the reactor building during a meltdown scenario to physically check the pump. Workers also had to repeatedly restart the system. Once the RCIC ran out of available water the meltdown rapidly progressed and workers were unable to rally a response sufficient to stop it due to the massive disaster at the plant. The RCIC pump system also has some well known flaws, including various valve and piping weaknesses. This system was a last line of defense yet depending on it may be a risky proposition. The automated system for the RCIC works on a low water sensor that starts the RCIC, this activation can limit manual operation until the signals have cleared the system. Operation of the RCIC cooling loop requires a number of valves to route the water and access the CST tank for water supply. Failure of any of these valves can fail the system. The valves can shut if a steam line failure is detected, to prevent the release of radioactive water via this system. The RCIC turbine runs on steam off of the main steam line “A” and exhausts that steam to the suppression chamber. So operation of the RCIC contributes to the heat the suppression chamber must deal with. The steam exhaust of this system also includes over pressure safety features and rupture discs that would fail into the RCIC room. This could cause steam and or water to build up in the RCIC room. Workers who entered the RCIC room noted standing water in the room that was later seen to be rising but were unable to identify the cause. The RCIC system can operate on DC only power. This can be challenged by a situation where all DC power is lost as was seen at Daiichi. Workers scavenged batteries to actuate systems and read instruments. Workers also had to restart the RCIC system multiple times after what appeared to be system trips. A number of things can shut down the RCIC including turbine over speed, electricity over 110%, a mechanical trip, low pump suction pressure, high turbine exhaust pressure or an isolation signal. All of these factors can add to the unreliability of this system. In the case of unit 2 this was the only cooling system they had available and when it was finally lost the meltdown rapidly progressed. The SRV valves played a critical role in the events at unit 2. This system is obviously important in any reactor but may have been a failure point during events at unit 2. The SRV (steam relief valve) system dumps excess steam, pressure and heat from the RPV into the suppression chamber. These important valves are known to have a time and heat based set of failure points that are within the bounds of operation during an extreme event. These valves can operate 440 open/close cycles in the first 10 hours of an event. The SRV system has an automated routine that can run to actuate these valves or they can be manually operated. High heat and repeated operation of the valves can cause the valves to fail in an open configuration 4100 to 4600 seconds after the first 10 hours if temperatures of 800-900k are involved. This is roughly 11 hours of operation over 526 Celsius. If an SRV valve were to fail open it would contribute considerable amounts of steam, heat and pressure to the suppression chamber. These valves are also known to be capable of failure into the drywell containment vessel. The mixture of materials in the valves and use of seals on the valves can cause them to fail externally, dumping steam, heat and pressure into the drywell. This would significantly contribute to the heat, steam and pressure in containment where over pressure and containment failure are already a risk. These material valve failures can occur at 900k (626 Celsius). Higher temperatures can cause more rapid degradation or seizure of the valve. At later points in the extreme events at unit 2 pressure and radiation levels in the containment vessel rose to dangerous levels. These SRV valves could have contributed at least in part to that issue. The existing research on SRV valves show that they can fail in a significant accident such as the one unit 2 experienced. In the events at unit 2 TEPCO workers document the time they were finally able to successfully open the suppression chamber venting valve and the time that they later closed this valve. A superficial look at the events at the plant may have lead many to assume this venting was a brief event to relieve pressure of the containment vessel. In reality it was a much longer and significant event. This unfiltered venting via the now saturated suppression chamber created a 2.5 hour direct pathway from the containment drywell and for a portion of the time from the RPV itself, to the open environment via the unit 1-2 vent stack. This happened at the height of the meltdown and after the estimated bottom head failure that would have sent the molten fuel falling into the pedestal of the drywell. RPV steam was also routed to the now open to the environment suppression chamber during this venting in an effort to lower pressure in the reactor. This event has been underestimated in most of the public accounting of the disaster. The start of this venting matched up with the significant jump in radiation at the main gate and detection of neutrons also at the main gate. Even after this venting was concluded the drywell continued to experience increasing containment pressure that left those at the plant fearing it would catastrophically fail. The need for this venting is obvious, without it there may have been an even larger containment failure that could have left a much larger path to the environment that they would have no ability to close. Even with this desperate venting attempt, containment did eventually fail. The top head gasket is assumed to have failed based on the significant steam releases out the blow out panel. Later findings where robots were sent into the refueling floor found high levels of radiation and a still leaking steam plume out of the reactor well, indicating the top head containment gasket had failed. This is a known potential failure point in BWR reactors. The venting effort also did not prevent conditions from degrading further out of control to the point that there was some consideration of abandoning the plant. The following morning emergency procedures were instituted and some of the staff evacuated the plant briefly until it could be confirmed that the situation was not going to spiral even further out of control. Some understanding of the behaviors of the meltdown at unit 2 can be determined by the visual evidence and data collected after the initial disaster. The suppression chamber has been found to be relatively unscathed. Repeated robotic inspections of the suppression chamber and the torus structure have not found any evidence of corium burning through into the room. Radiation levels in the room and torus tube are relatively low and visible damage is quite minimal. This is a drastic difference from what was found inside unit 1’s suppression chamber. It is relatively certain that the suppression chamber of unit 2 did not experience an explosion and did not suffer from corium flowing into this area. 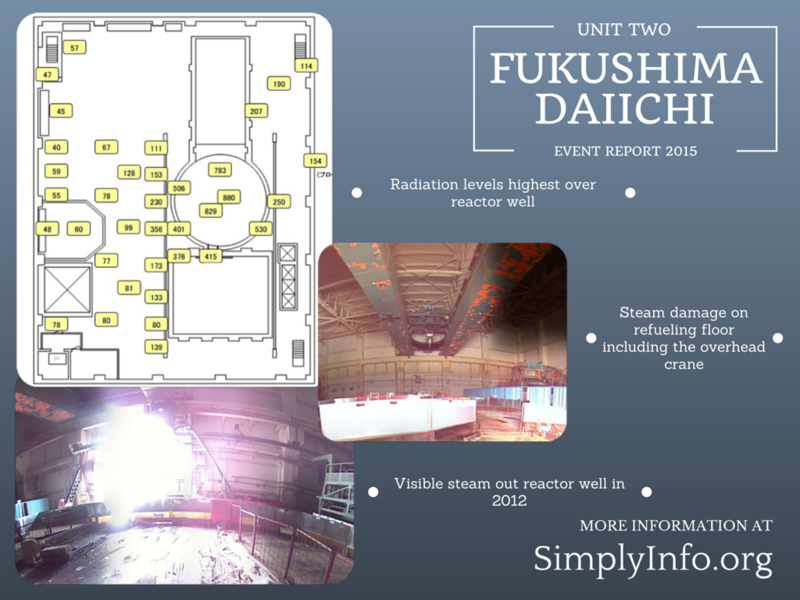 The shared vent tower for units 1-2 has some of the highest radiation levels at the plant. One reading taken was over 10,000 mSv/h and may have been much higher. This could have been caused or contributed to by the venting of unit 2. The refueling floor of unit 2 was heavily saturated with steam for long periods of time based on reported evidence of steam out the blow out panel and the steam related damage in the refueling floor. The reactor well concrete cover was found to have significantly high radiation levels as high as 800 mSv/h indicating this area was involved in the meltdown, most likely as a failure path for containment pressure to escape. This route is also admitted by TEPCO to be a significant leak route for radiation to escape via the air into the environment. In 2012 it was admitted this leak route out the blow out panel was sending 10 million becquerels per hour to the environment. TEPCO later sealed up this opening and installed a filtration system. The containment structure itself has had significant radiation levels found inside. Scopes put into unit 2’s containment showed evidence of extremely high heat and steam. Radiation levels found at the edge of containment were around 75 sieverts an hour. Taking this number and applying a distance calculation to the pedestal showed that with the pedestal as the assumed source point of the radiation reading, levels inside the pedestal would be incredibly high. This would indicate that the corium mass most likely stayed inside the pedestal and burned down. Sandia National Lab’s computer modeling of unit 2’s meltdown also assumes this was the case, that the corium did not leave the pedestal in significant amounts. 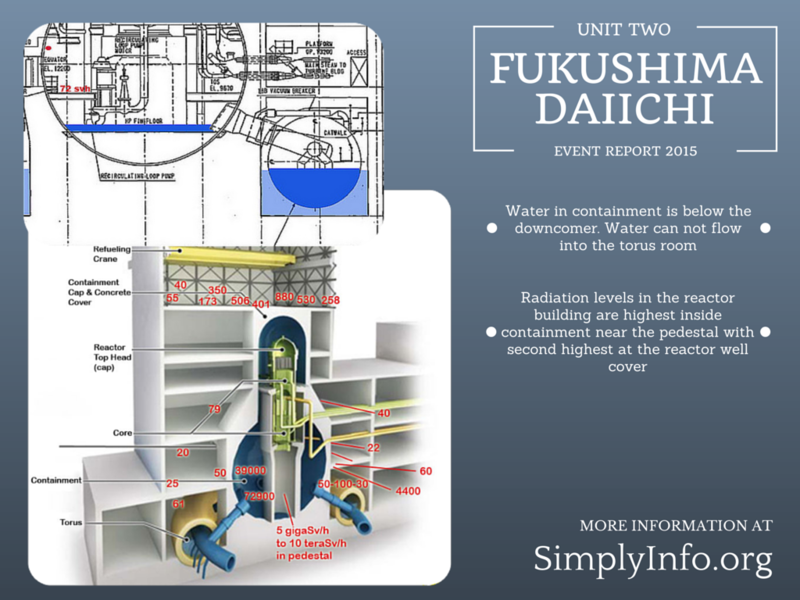 TEPCO also noted that the standing water inside the unit 2 containment drywell was below the lip of the downcomers, indicating the water was not flowing out via the downcomers to the torus tube in the suppression chamber room. Their investigation of the suppression chamber room concluded that they do not think the water from the drywell is leaking into the suppression chamber room via the sand pockets or other interfaces between the two. Water must be finding another exit point from the drywell floor yet no obvious designed route exists. Radiation levels admitted by TEPCO showed the remaining portions of the building were not excessively contaminated vs. what is found in the locations mentioned above. This all indicates that the bulk of the contamination centers in containment and in the pedestal where the corium mass could have continued to burn down into the basemat. The existing evidence all lends credibility to this theory. Where radioactive contamination is found in relation to unit 2 can also give some hints about the failures in this reactor. 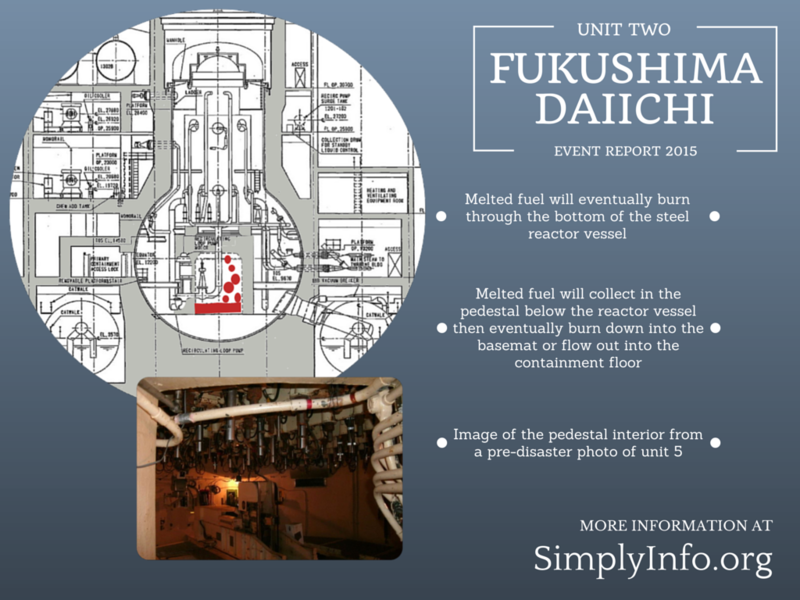 Highly radioactive water was found in the unit 2 turbine building basement soon after the disaster unfolded. The assumed leak path for such a thing would be the suppression chamber room as it has some interfaces into the turbine building. But the suppression chamber room lacks this kind of highly contaminated water or high radiation levels that would indicate its involvement. So this expected path to the turbine building is obviously not in play. The main steam isolation valves are another concern. This room was inspected by robots and was found to be almost pristine and without damage, high radiation levels or contaminated water leakage. How this ongoing mass of highly contaminated water (readings of 1 sievert an hour) is finding its way to the turbine building basement is without an obvious expected route. Highly radioactive water of the same 1 sievert/hour level was also found in the cable trench for unit 2. The water was initially found pouring through penetration holes in the trench and a crack in the concrete. TEPCO also later admitted that the trench has a gravel bottom. An early news article on the radioactive trench water, published by Kyodo, had officials admitting that the containment could have holes or cracks that was allowing the highly radioactive water to flow into the turbine building basement. More current efforts to deal with this trench found that blocking off the turbine building connections to the trench did not stem the flow of highly radioactive water into the trench. An effort to concrete in the horizontal section of the trench commenced. 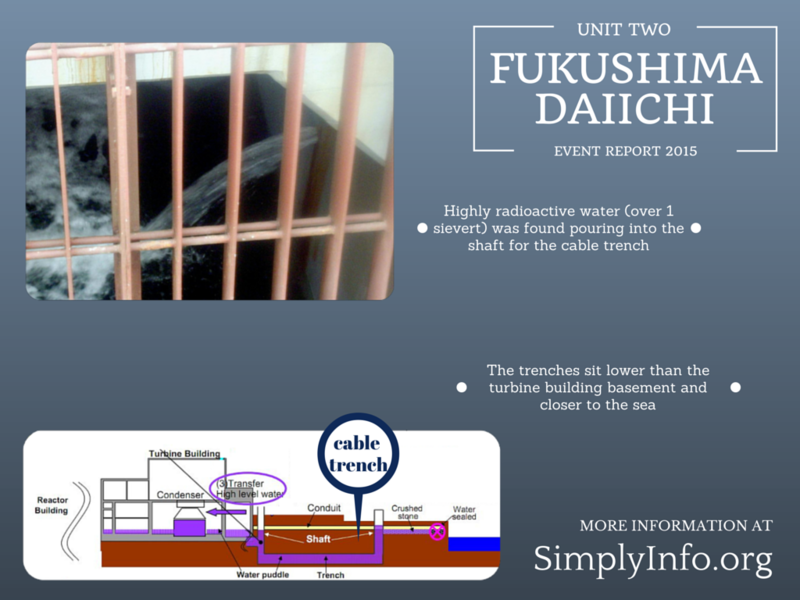 After this, TEPCO found that the two shafts that lead down to the trench were somehow connected. Water removed from one shaft would influence the water level in the other. This indicates that additional mechanisms for highly contaminated water to travel into the trench shafts likely exist. This then raises concerns that this highly radioactive water is not being contained solely within the turbine building basement and cable trench. 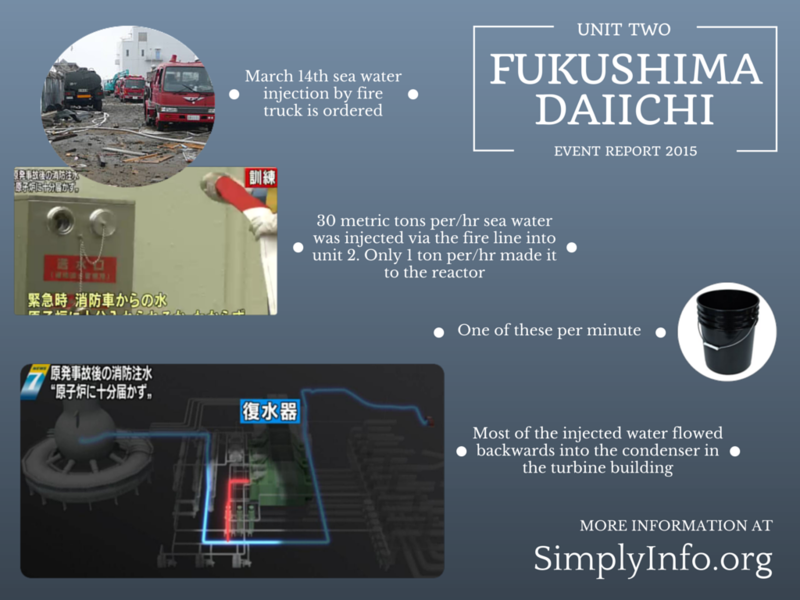 The potential for such highly radioactive water to exist uncontrolled under the unit 2 buildings also raises concerns that it could be the cause of some of the other contamination mechanisms. Oceanographers identified what they think is a point further out to sea where contaminated groundwater is bubbling up through the sea floor causing cesium levels in the area to not go down as anticipated. If unit 2 is indeed releasing highly radioactive water outside of the buildings, it could provide a mechanism for that phenomenon. Japan’s NRA stated recently that they think there is another mechanism for contaminated water to flow under the plant out to sea but did not specifically implicate a cause or reactor unit to blame. While a total melt through of the basemat is a frequently discussed concern, other similar issues could meet the same end. Other failures of the basemat such as degrading, partial structural failure or other methods to create holes, fissures or large cracks in the basemat could provide a leak path for highly contaminated water without a total burn through. Unit 2’s meltdown and post meltdown progression was well anticipated by TEPCO based on their actions and their failure time estimates. TEPCO opened the torus vent line to the environment and left it open for 2.5 hours while fuel was likely already outside of the vessel and in the containment drywell, giving a clear route between corium and the environment. This action may have been unavoidable based on the available data from unit 2 in order to avoid a much larger containment failure that could not have been closed. It may have been the lesser of two bad options. The available data and visual evidence for unit 2 show that contaminated water and fuel may have found a route out of the building through the basemat area. This highly radioactive water has shown up in the unit 2 turbine building basement and in the unit 2 trenches at the sea front, indicating the highly contaminated water may be flowing outside of the reactor building and in a manner quite different from the other two damaged units. If this is further confirmed to be the case, this may be a significant contributor to the ongoing highly radioactive water leaks that have defied efforts to block them. 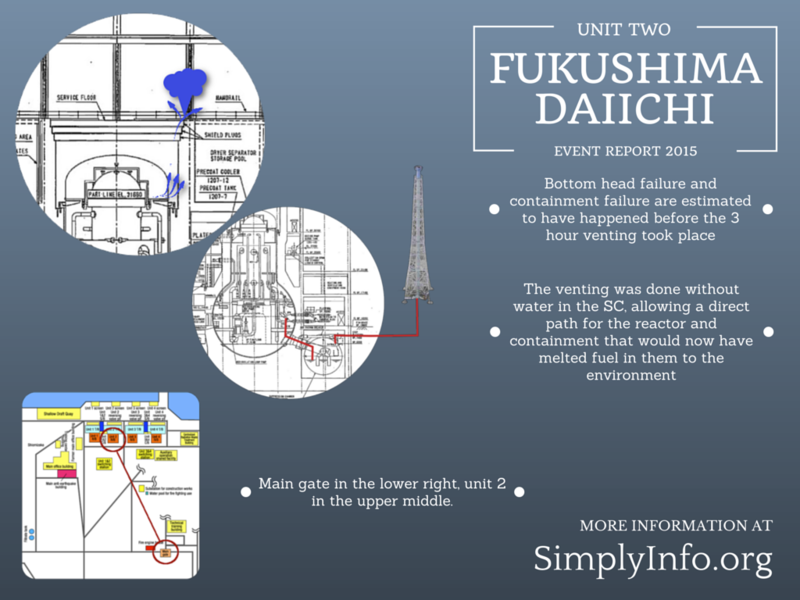 Unit 2’s containment failure via the containment cap gasket continued to contribute a large percentage of the radiation escaping into the air at the plant even a year after the meltdowns. While the other two units have been admitted to have some failure or leakage from their reactor wells, unit 2 appears to be the major contributor to airborne releases via this route and continued to do so. Newer information such as the failure of seawater injections to reach the RPV further ads to the growing body of information that indicates unit 2’s meltdown was far worse than initially assumed. Many early estimates of the extent of unit 2’s meltdowns were dependent on the assumption that water reached the melting fuel in quantities large enough to cool or cover the melted fuel. This newer understanding of the water injection shows those early estimates to be incorrect and that unit 2’s meltdown was much more severe than initially assumed. 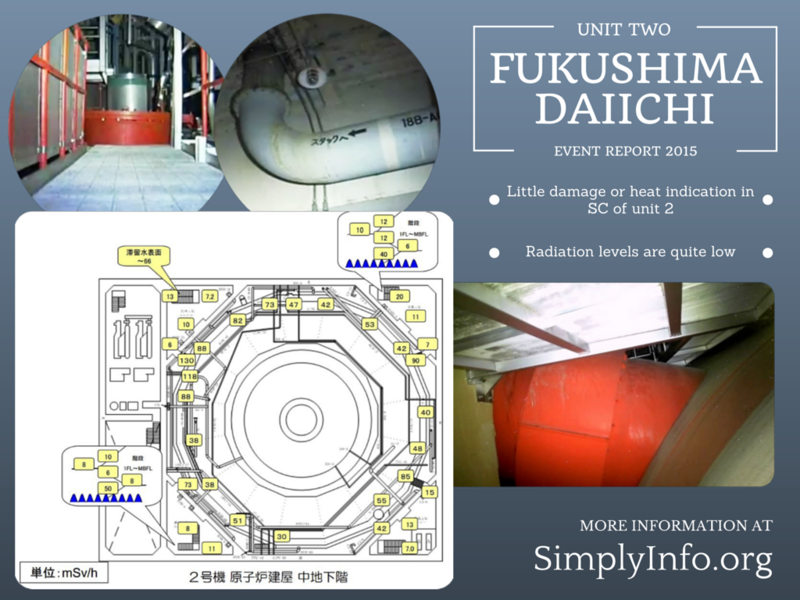 The timing of major events at the plant that tie to events at unit 2 and TEPCO’s increasing alarm over the degrading conditions of the plant indicates that unit 2 may have posed an even larger threat than the other two units at the plant. The chance event of the blow out panel dislodging early in the series of events may have helped unit 2 avoid a hydrogen explosion as seen at the other units. The actual meltdown and the extent of the damage at unit 2 may have been worse in many ways.